Whether you’re remodeling your home or you’re building your first home, your choice of water heater greatly impacts you and your family. Since 19% of the energy used in the average Canadian home goes to water heaters, your decision on what type of water heater to buy will have a lasting impact on your family’s finances, as well as the quality of life for your family. A storage water heater is a big, cylindrical tank with pipes attached to it. It has 2 functions: it heats water and stores water until its needed. A storage water heater that is meant for a single family offers a standby supply of 75 to 302 liters of hot water. When you turn on the hot water tap, hot water is released from the top of the storage tank. To replenish the hot water, cold water enters at the bottom of the storage tank. In order for the water inside of the storage tank to remain warm, the water is constantly being heated even though there isn’t a hot water tap turned on. This constant heating of the water in the storage tank, called “standby heat loss”, wastes energy. Flush a quart of water from the storage tank every 3 months. Check the pressure valve and temperature every 6 months. As a safety measure, all storage water heaters are fitted with temperature-and-pressure relief valve. In the even that either the pressure or temperature goes beyond a safe limit, this valve opens. Inspect the anode rod every 3 to 4 years. All storage water heaters have an anode rod. The purpose of this rod is to control corrosion – the primary reason to storage tank fails. The rod is specifically designed to corrode. As such, it’s important to inspect the anode rod every 3 to 4 years and replace it when necessary. 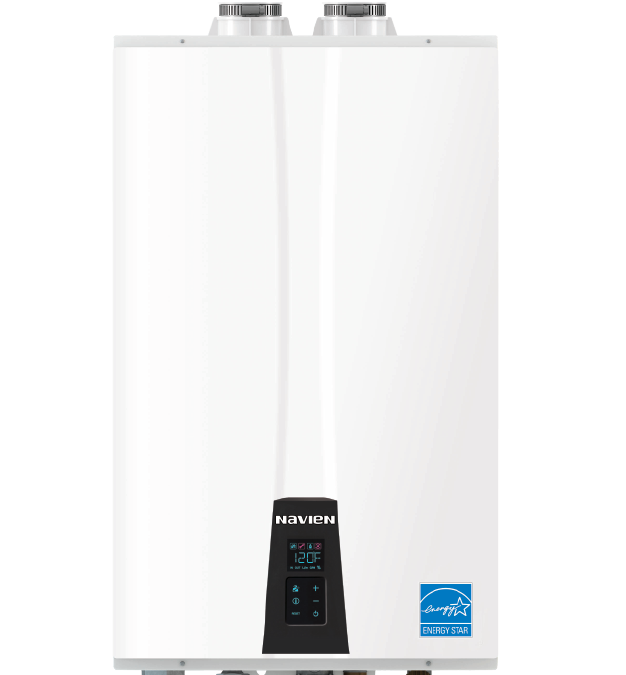 A Navien tankless water heater is a specific type of tankless water heater that offers a continuous flow of hot water, without the large, cylindrical tank. Navien tankless water heaters, specifically the Navien NPE tankless water heater series, can be mounted on the wall and occupy 80% less space in comparison to the 302 liter storage-type water heater. The biggest model of the Navien NPE tankless water heater series is only 17.3”W x 27.4”H x 13.2”D. The Navien tankless water heater don’t waste energy as the storage-type water heaters do. Tankless water heaters only heat water when it is in use; therefore, there’s no cost for maintaining heat. According to the U.S. Department of Energy (DOE), for a household that uses 155 liters or less of hot water every day, a tankless water heater can be 24% to 34% more energy efficient than a storage-type water heater tank. The U.S. DOE added that a tankless water heater can be 8% to 14% more energy efficient for a household that uses a lot of hot water – approximately 325 liters each day. According to Natural Resources Canada, a typical Canadian household uses an average of 75 liters of hot water every day for showering, cleaning, washing dishes and clothing. ENERGY STAR estimates that the average family can save up to $100 or more each year with an ENERGY STAR qualified tankless water heater; the Navien tankless water heater is an ENERGY STAR tankless water heater. The purchase price of the Navien tankless water heater can be higher than the storage-type water heater; however the long life span, low operating costs and low energy costs can offset the initial rate. The Navien tankless water heater has parts that ensure years of trouble-free service. The heat exchanger in the Navien is made of stainless steel, not copper, extending the life of the heater by resisting corrosion. It also has the industry’s longest warranty, including 15 years on the heat exchanger. The operating cost of a 189 gallon storage-type water heater (based on the annual estimated residential use per U.S. DOE test criteria) is $293 and other tankless water heater brands are $228, while the Navien tankless water heater’s annual operating cost is only $191. Depending on your location, you can also avail for a variety of energy efficiency credits and rebates. “It’s important to remember the cost of energy to operate a product over its lifetime is just as important as its purchase price. For water heaters, the operating costs are calculated by factoring in the size and type of unit, the energy source, and the equipment’s energy efficiency,” Natural Resources Canada said. Since the Navien tankless water heater only uses energy when hot water is needed, it not only saves you money, but it also lowers the impact on the environment. This particular water heater doesn’t waste energy to heat a large storage tank. A Navien tankless water heater makes the most of your money by using up to 99¢ of every $1 that it costs to actually heat your water. The Navien tankless heater reduces the amount of carbon dioxide released into the atmosphere by 1,216.8 lbs. per year when compared to conventional storage-type water heaters – equivalent to 62 gallons of gasoline in your car. With NaviLink, the Navien tankless water heater’s optional Wi-Fi remote control system, you can check your heater’s status from anywhere once you have an internet connection. Contact us today and protect your family’s comfort.